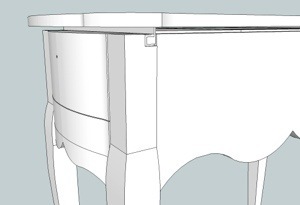 One of the things that makes this project complex are the mechanisms on which the table operates. Although I have several pictures of them from my trip to the Getty, I still needed to draw everything out. This is necessary not only to have them manufactured, but also to ensure that everything fits together and operates smoothly. Despite these reasons, it’s a major pain in the posterior! 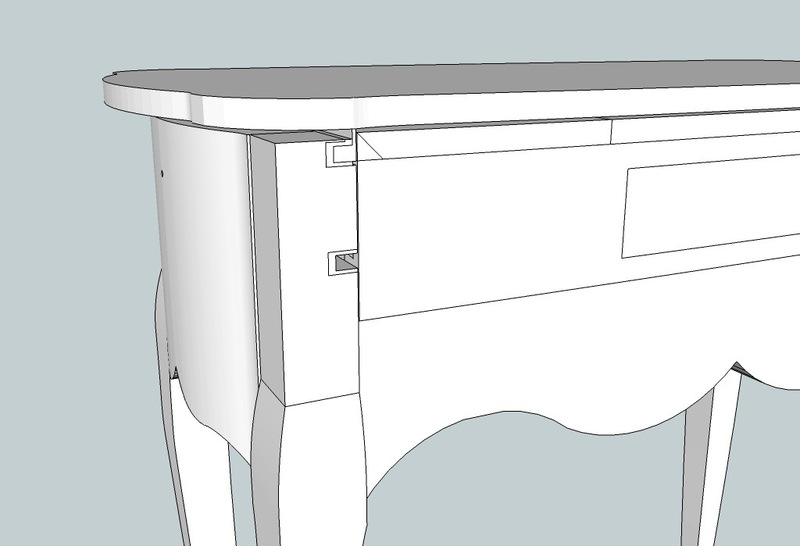 SketchUp is a fantastic design tool/laboratory. By determining proportions from the aforementioned pictures, I created scale drawings of each of the mechanism parts. 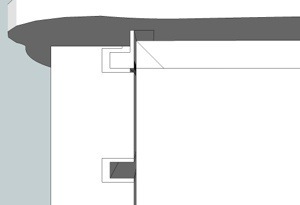 While the urge to send these individual part drawings off for manufacture was great, better judgement prevailed. Luckily, this averted a “situation”. Instead, I methodically fit the pieces in place in the carcass model, and made several “discoveries” along the way! The top rack and guide are offset toward the outside of the carcass. The upper racks are offset toward the outsides of the carcass least they interfere with the main box travel. Here’s surprise number 1: if I mount the upper racks and guides flush with the inside of the carcass, they will interfere with the “main box”. Checking my photos, sure enough, the original makers moved the racks and guides outward to make the room necessary. 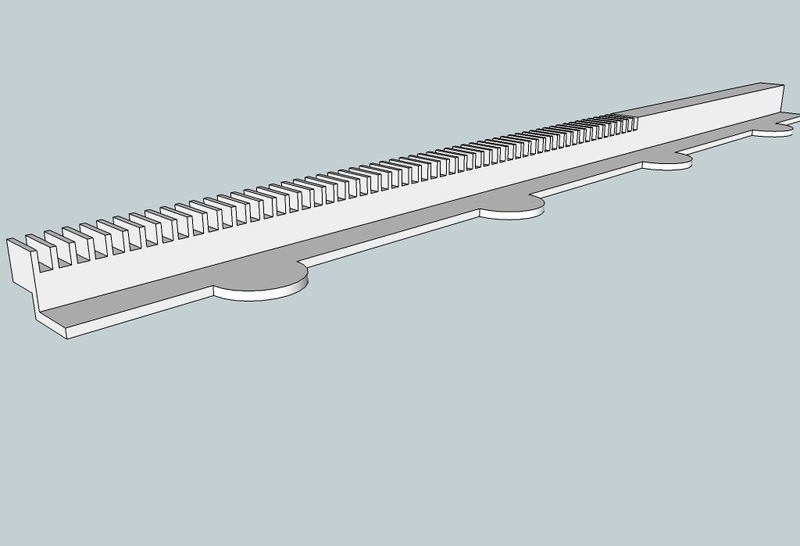 Initial model of the upper rack (it’s upside-down). It’s not tall enough! Also, I needed to extend the height of these racks so that the top cleared the main box. My photos provided the multiple aspects necessary to deduce their dimensions. However, they can be unreliable sometimes. Small errors propagate. 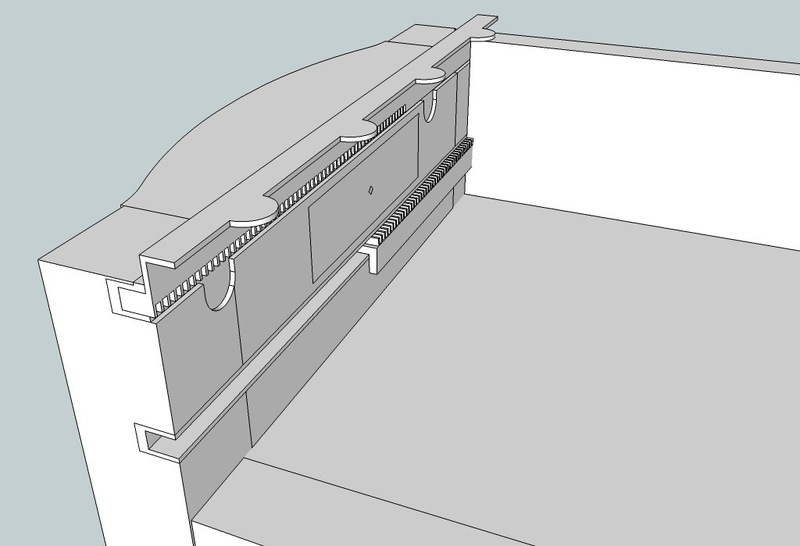 “Installing” the racks into the SketchUp model allowed their height to be tweaked, and the top to clear the main box to the desired level. Fixed the upper rack. Now the top will clear the main box! This process also helped me discover a quirk with the lower rack installation. The lower guides mounted to the carcass sides extend beyond the inside face of the rear panel, that is, the back. Although I’d seen this before, I had never really considered the rationale for it. I figured that the makers were being lazy. Turns out it has a critical purpose. It accommodates the movement of the lower rack (the one fixed to the main box) when the table is closed. I didn’t realize it, but the back panel in the original is mortised just for this reason. The evidence was there in the photos the whole time. I just didn’t see it until my attention was drawn by this. Note how the lower rack projects into the rear panel? The original is mortised out for just this purpose.